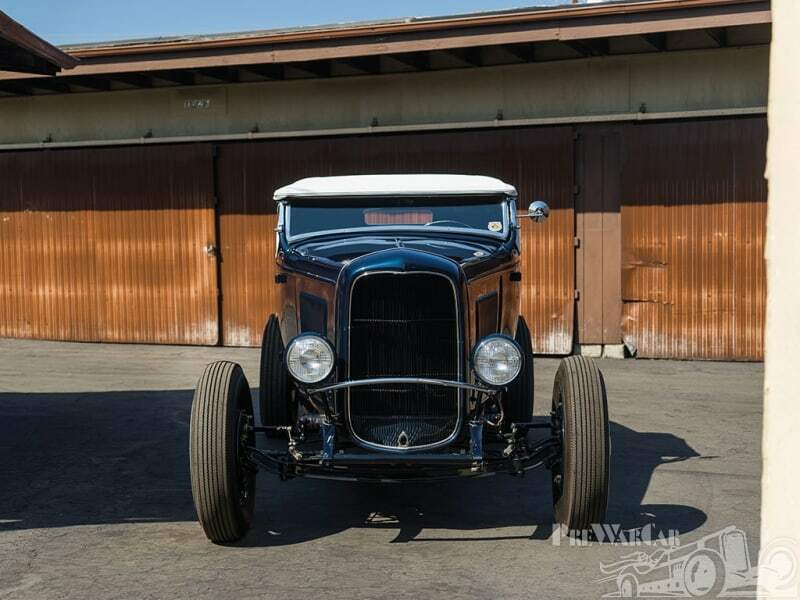 What a great piece of Hot Rodding and Drag Racing history up for grabs, sure wish I could own this Gem. I still love the timing tag. The only one I know of issued by Russetta during the war that still exists. One week after the Normandy invasion. It was done on galvanized roofing material. 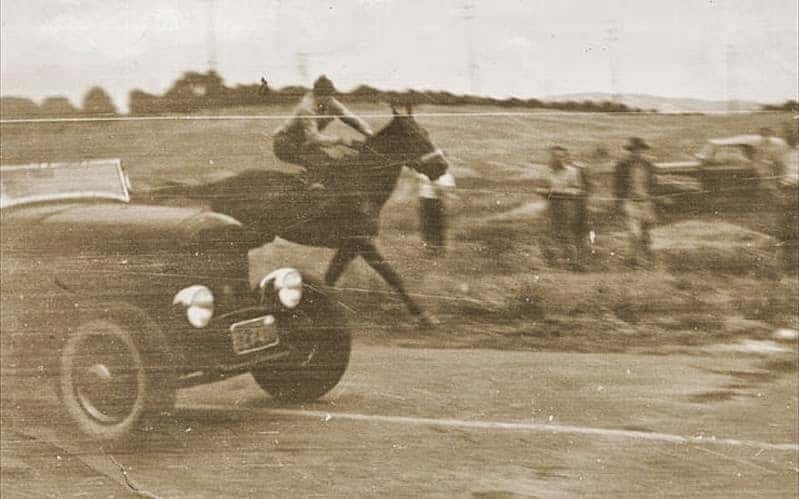 Remember the Hot Rod racing the Horse back in 1944? 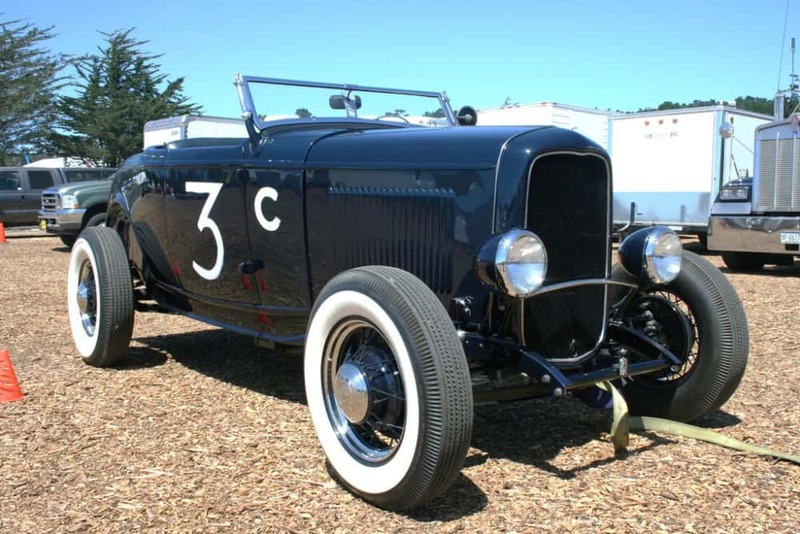 Well now this Roadster of Pete Henderson is now up for Auction at Sotheby’s, sure hope a Hot Rodder buys this. To be OFFERED AT AUCTION at RM Sotheby’s Hershey event, October 5-6, 2017. As the story goes, back in 1944, a guy with a quick quarter horse won countless bets challenging hot cars to a race. This roadster, however, had a reputation as the quickest car in the San Fernando Valley. With Pete Henderson behind the wheel, in a specially staged race held in La Habra, and witnessed by a large crowd, including speed equipment gurus Vic Edelbrock Sr., Ed Winfield, and Phil Weiand, this deuce was the only car that ever won. 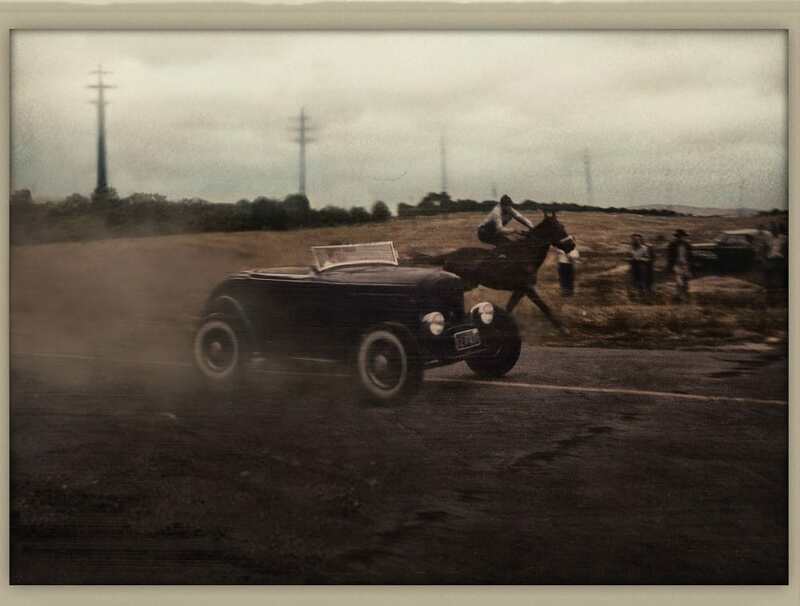 Ernie McAfee took a famous grainy photo showing the roadster edging out the horse. Noted hot rod racer Ak Miller and writer Gray Baskerville always said they could trace the origins of ¼-mile drag racing to that famous contest. A few months earlier, 18-year-old Pete Henderson had purchased the speedy ’32 from Don Casselman. It was equipped with a Don Blair-built, bored, and stroked 296-cu. in. Mercury flathead, running a hot cam from the legendary Pierre “Pete” Bertrand. Milled aluminum “Denver” heads, a Weiand high-rise dual intake manifold with twin Stromberg 97s, and a Spaulding dual-point, dual coil ignition rounded out the engine modifications. 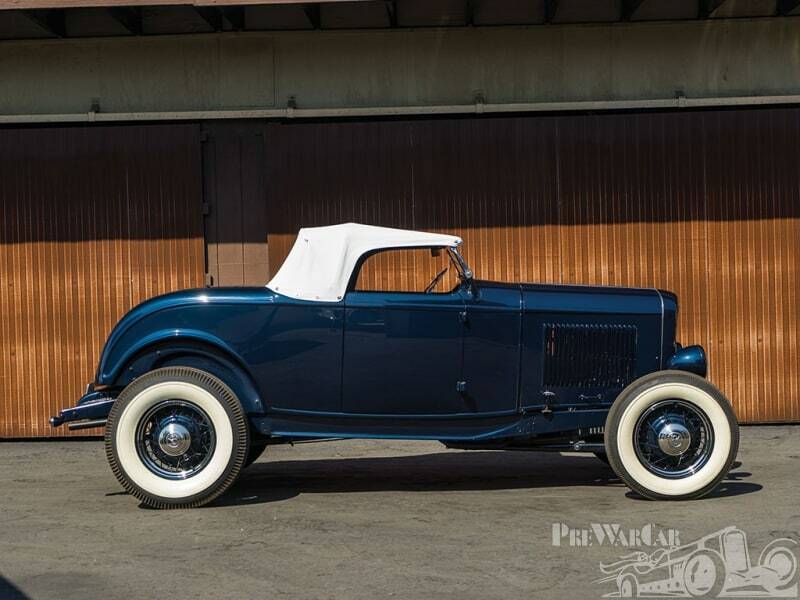 Typical of street roadsters in that era, it had a neatly chopped top, but it retained the original Ford ‘push and pray’ mechanical brakes and wire wheels. On the dash, a Russetta Timing Association timing tag attests to a 120.9-mph run at Harper Dry Lake in 1944. Pete Henderson sold the car in 1946 to L. K. Chappelow of Monrovia, California, who owned it for a year before selling it to Manny Ayulo. Surviving photos show the ex-Henderson roadster competing at many L.A.-area circle tracks, driven by the soon-to-be Indy 500 star Ayulo, and later by racing stalwart Jack McGrath. 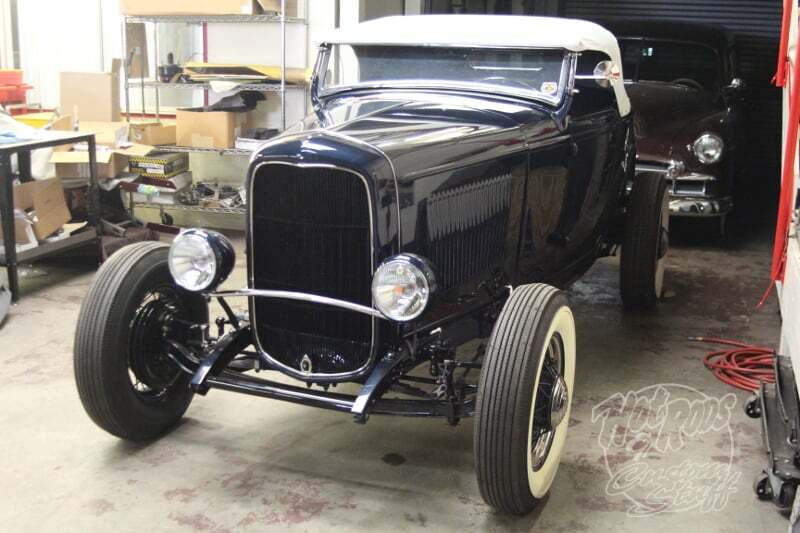 Miraculously, this roadster survived all that rough-and-tumble bullring competition and became a noted street ’32 highboy, owned by George Rowland, who added bobbed rear fenders by Art Chrisman, baby moon caps, and wide whites. Ralph “Digger” Guldahl Jr. acquired it in 1955, installed a new 265 Chevy V-8 to replace the now-tired flathead, and the roadster appeared in a host of “B” movies, including Hot Rod Gang and The Spider. Steve Lydecker bought the much-traveled deuce in 1957 when Guldahl was drafted. In ensuing years, it was owned by Art Vitteraly, then channeled, powered by a Buick V-8, and it is not known what else transpired before Robert Takahashi bought the car, after which it was purchased by Chuck Longley in June 1977. Longley ran a few advertisements hoping to learn more information on the roadster. 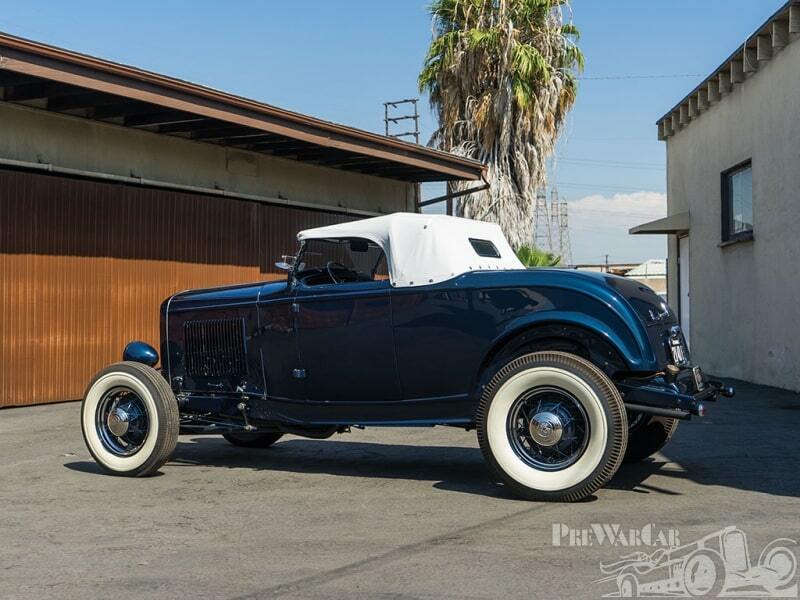 His query about its identity was answered by none other than Pete Henderson, the former Pasadena ‘kid’ who first made this ’32 Ford famous. As they talked, when Chuck mentioned the car’s Auburn dash panel and several distinct filled holes, Pete said “ . . . it kinda sounded like my car.” Chuck asked if Pete still had the roadster’s serial number. He did. And it was the same car! The historic deuce still retained its original body, frame, and chopped windshield when Chuck and his son Mike began the restoration in 1995. 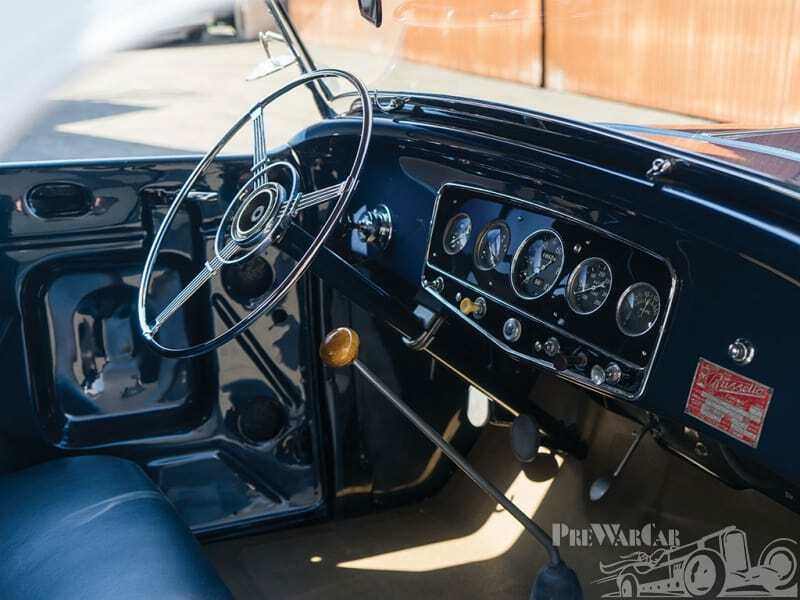 After perusing old photos of the car, they located a proper flathead V-8, a ’34 Auburn dash panel, that rare accessory rimless steering wheel, an early Cadillac fuel pressure pump, a pair of ’39 Ford teardrop taillights, and a host of other period parts. 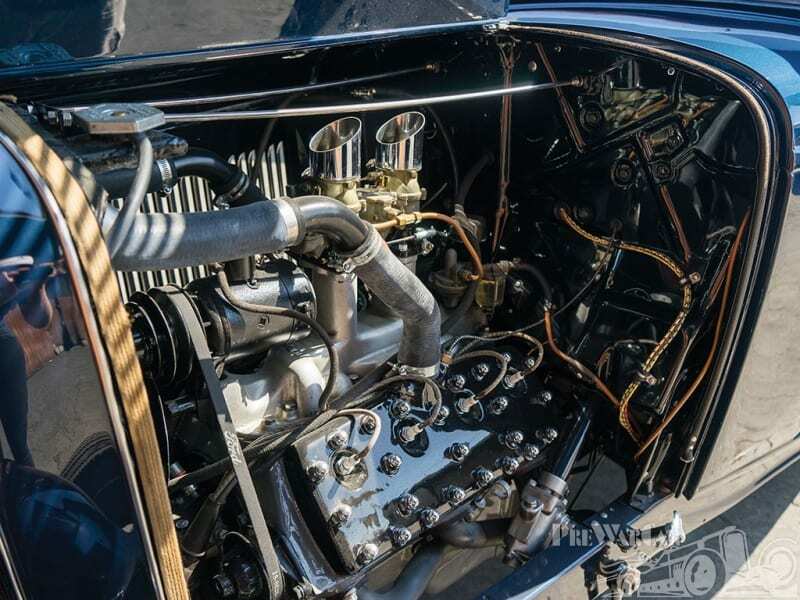 After its restoration, the Longleys brought the car to the L.A. Roadsters Father’s Day meet where it was a big hit, and then took it to the Amelia Island Concours d’Elegance, where it was awarded best historic hot rod. 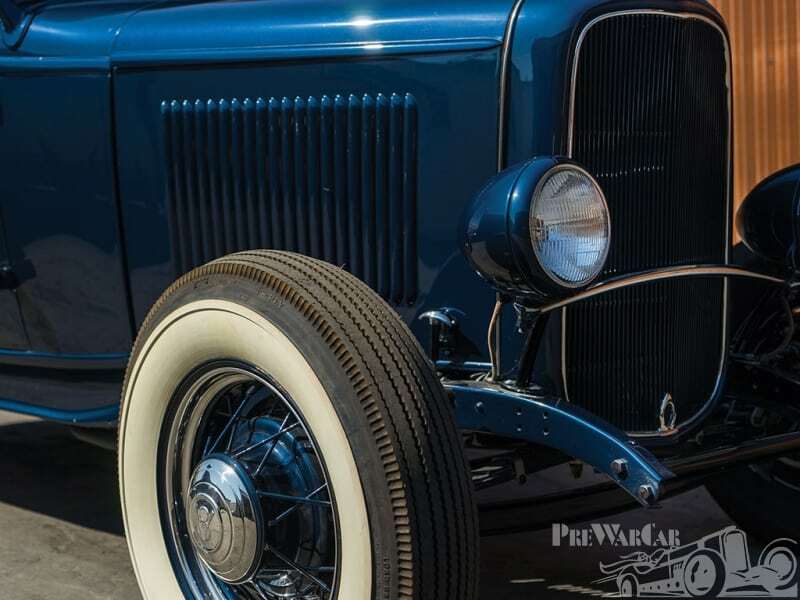 With a panoply of famous owners, Top 75 ’32 Ford honors, a sparkling and accurate restoration, and the understated good looks of a classic deuce highboy, the “Pete Henderson” roadster is ready for an appreciative new owner . . . and its next quarter-mile challenger! You can also Purchase it and Donate it to me, I will always cherish it. 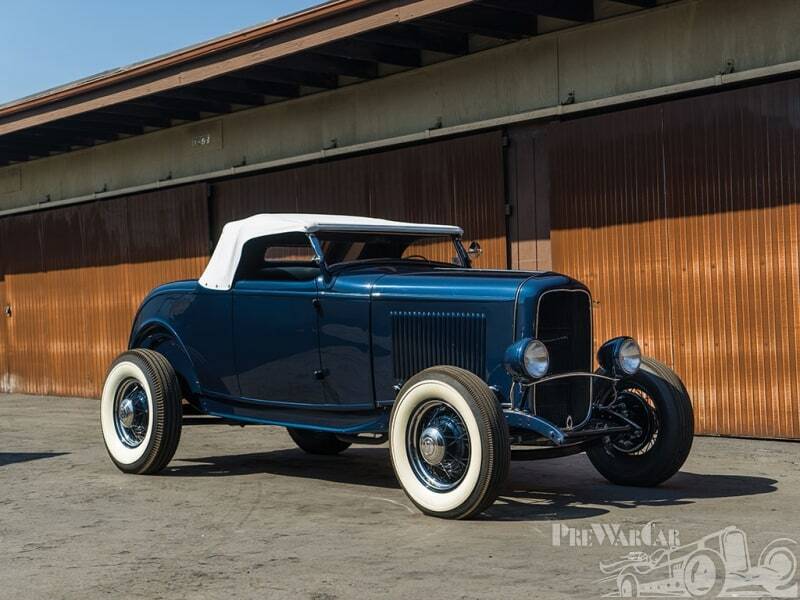 This entry was posted in Blog and tagged 1932 ford, Deuce, fenderless, Firestone, flathead, Ford Blue, Highboy, Horse race, hot rod, I Beam, kelsey hayes, Pete Henderson, roadster, Roadster Hot Rod, Russetta, scta, sothebys, stromberg, timing association.